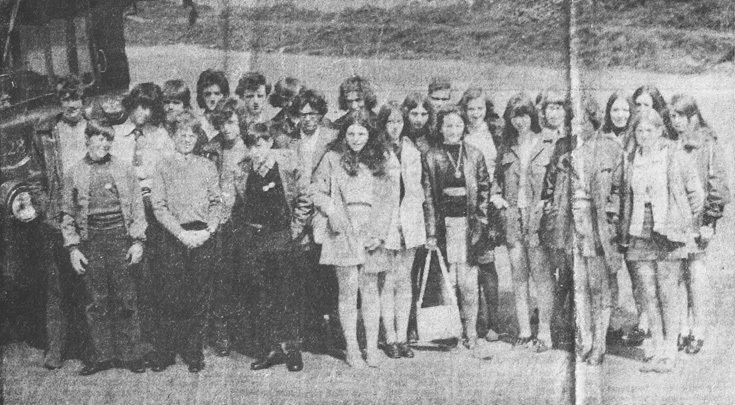 This picture shows Invergordon Academy pupils outside Dingwall Academy (the muster point for Ross-Shire pupils including Dingwall and Tain) prior to leaving to join the SS Uganda on its Scandinavian/Baltic educational cruise in May 1972. I was one of those lucky enough to experience the cruise. The first part of the journey was on a double decker bus from Dingwall to Dundee - ouch! The photograph was from the Highland News and Football Times May 25 1972. Boys:Sanders Fraser, Brian MacLeod, William Reid, James Gunn, Alistair Rhind, Magnus Campbell, myself immediately to his front, ?, Ian Mitchell, ? , Alan Leask, John Roberston. Girls: Audrey Tominlinson, ?, Franka Jackson, Kathryn Mackay, ?, Ann Ross, ?, ? Robertson, ?, ?, ?, ?. Hi Graeme, I have a copy of this photo too! I can fill in some blanks in the girls. Audrey Tomlinson, Alison Ralph, Franka Jackson, Fergus Urquhart at the back, me, ?, Ann Ross, Mary Robertson, ( possibly Christine Clark), Meg Danial at the front with Barbara Rhind hiding behind her and ? at the end. I think it was taken outside Invergordon Academy just before we left. And the reason we were on a bus was there was a rail strike. Lovely to see this photo from the past and recall great memories.